We're all looking for ways to improve our health. You can get the diet under control. That's easy. Just avoid refined carbohydrates, junk food and sugary foods. Add a few more veggies into your weekly meal plan and you're good to go. Good. Now what? Sleep. We all need more sleep. You can invest in a pair of blue light blocking glasses and go to bed early. Great. That's a whole lot harder to control. And it comes with a huge load on your health. It was the thing I struggled with the most when I switched to a healthier lifestyle. The rest, in comparison, was fairly simple and could be measured with facts. Hours of sleep per night. Number of meals per day. Amount of times I refused the plate of doughnuts. But how on earth do you measure progress with anxiety? To be honest with you, I still struggle now. There are times when I'll feel an anxiety attack come on, or that familiar surge in heart rate after an argument, or dwelling too long on a problem that doesn't actually exist (we've all been there). It's been such a big part of my life since I was a child, that I think I've just become used to it. My system has a knee-jerk reaction to anxiety and stress. So I decided to take positive, decisive action. I needed a little toolkit of facts that I could bring out whenever I felt anxious about something. A list of proper, researched, scientific actions that I could take, that I knew would likely reduce my anxiety and get me back on track. I didn't want that awful sinking feeling any more. I didn't want any more emergency trips to the hospital thinking I was having breathing problems to be told it was 'just' anxiety. Anxiety, if you suffer from it, is a really big deal. And that's why I wrote this ebook. Simple Tips to Help Ease Anxiety is full of tips and tricks - actual actions you can take right now - to help ease any anxious feelings you're having. It's also well researched - you can see the relevant studies relating to each tip (most of them have one) at the back of the ebook, and read the findings of the studies yourself. I made a real effort to fill it with beautiful colour photography that I took too, because images of nature and beautiful things are calming in themselves. It's also set at a really low price. I wanted this ebook to be accessible to everyone suffering from anxiety - because trust me, I know exactly what that feels like. You don't need a special reading device or app - just a computer and online access to Gumroad. It's downloaded as a pdf file for you to keep and read whenever you need to. I hope it helps. And please share this blog post with any friends you think it might help, too. 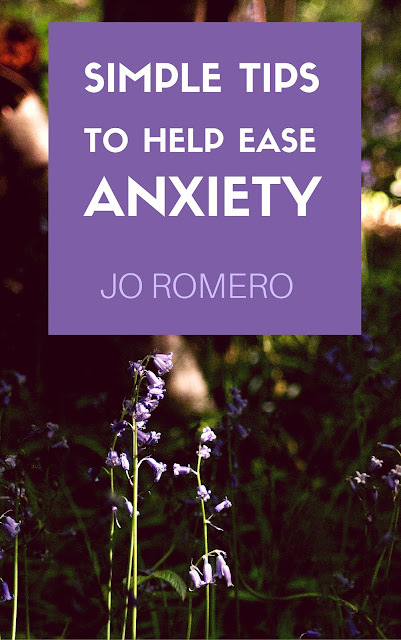 Click here for more details or to download Simple Tips to Help Ease Anxiety now.